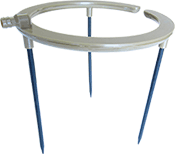 The Hydro Halo ensures an even supply of nutrient to the root zone of plants. Connection is made using standard 13mm tube directly to the inlet, and the three support legs hold the ring firmly in place around the plant. Once connected, nutrient can flow freely and evenly through the drip holes on the underneath side of the halo.